Holocaust Memorial Centre does not only house a heart wrenching permanent exhibition but also has various temporary and travelling exhibitions that add a little more to the historical aspect of Budapest. The permanent exhibition is a reflection of the torturous past that the Jews had to deal with. It also shows that Germany was not the only one hit by the unfortunate mentality of the Nazis but every place that Germany invaded thereafter had to suffer a lot. The Hungarian government had started curtailing human rights, liberty after the start of the World War. But after 1944 invasion of Germany, things got completely out of hand. 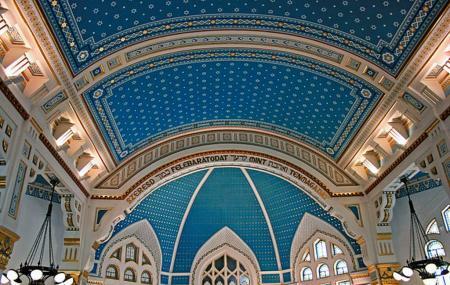 Today, it functions as a synagogue which is dedicated to the memory of Hungarian Jews who lost their lives during the Holocaust. For group ticket and guided tour price: visit the official website. Free admission: children under 6 years; seniors of 70 years age; people with disability along with their companion; last Sunday of each month for people under 26 and people under 18years and their immediate families; national holidays of Hungary. Ticket office: open till 5pm. How popular is Holocaust Memorial Center? People normally club together Liberty Bridge and Heroes Square while planning their visit to Holocaust Memorial Center. This is my first holocaust memorial I have been to. It was very interesting and sad at the same time. It is in two different languages, so no trouble for Americans to read. I loved watching the videos to fully grasp the details. The synagogue was gorgeous and make sure to go upstairs to read some scriptures from diaries and look at the artifacts. Prepare to spend at least 2 hours here to see and read all the details. By Back To The Beat! Very moving experience to hear what all them poor people went through and experienced. Totally unbelievable what suffering they experienced. We must never forget this and remember each and every one of them😢Definetely recommend a visit. Had a wonderful time there. Really interesting polarizing museum. Definitely worth it to go. Very saddening memorial with alot of information to absorb. Alot of distressing images and video so be wary with children. But definitely informative and a enlightening experience.